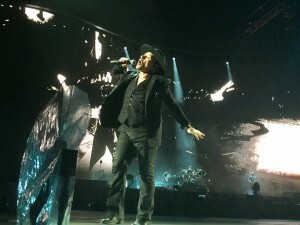 “I can’t believe the news today—too true an opening line—especially today.” A good friend messaged me this as I was driving to the stadium in Tampa, Florida to attend my fifth U2 show, an occasional but recurring pilgrimage that began in 1987, on the third leg of the original Joshua Tree tour. Three hours before Larry Mullen, Jr. would pound out the cadence to “Sunday Bloody Sunday” in an anticipatory rhythm to the song’s opening lament, I was once again confronted with the scarred American landscape. A quick scroll delivered successive gut punches. A gunman with a military grade rifle had opened fire on a congressional baseball practice in Washington, DC. Another workplace shooting and suicide had taken place in San Francisco, CA. And of course, a divided citizenry found themselves again all too eager to blame one another for the chaos. The “Sunday Bloody Sunday” lyrics once required empathy and imagination, placing ourselves in the position of a young man coming of age in an Irish landscape torn apart by domestic terrorism, ignited by a Molotov cocktail of nationalism, religious dogmatism, and the dehumanization of the other. Now, no extra imagination or global empathy are needed, as this situation is ours, otherwise known as the daily American news cycle. 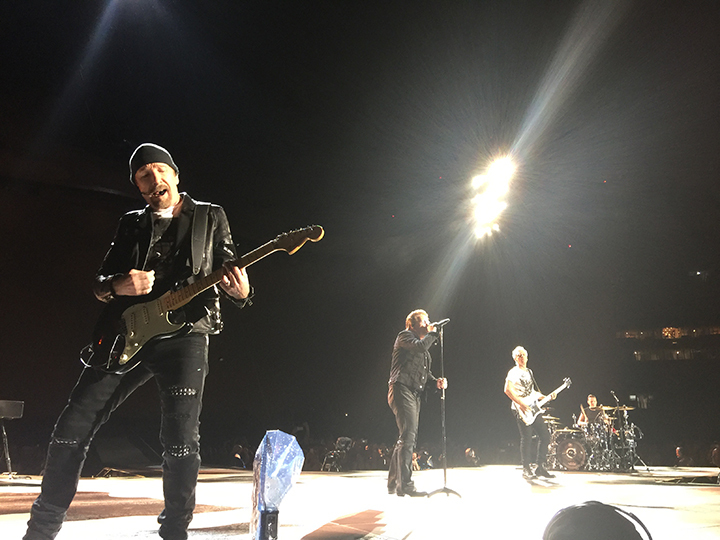 A U2 concert wouldn’t be, couldn’t be an escape from the fractured American landscape, could it? It wasn’t. Instead, it was a night of lament, recognition, and corporate confession punctuated with a dare to hope audaciously. 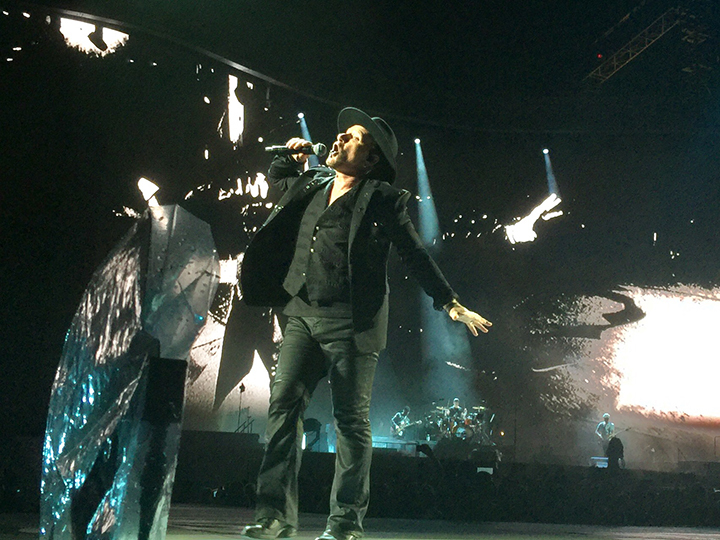 With U2, we creatively act out the faith and dreams we allege to own with our professions. For two hours in the Florida humidity, some 60,000 people were invited to healing and commissioning in a place that Bono, in the midst of “I Still Haven’t Found What I’m Looking For,” declared to be a “church not made by human hands”. Throughout the night the band and its earnest frontman led us in a collective liturgy. Cynics could view this tour as an exercise in resting on one’s laurels, a nostalgic visit to the band’s watershed transformation from college radio favorite to worldwide phenomenon. But U2’s musical catalogue at this point functions like the canon of a classic text. While all songs are rooted in particular experiences and specific temporal and social locales, the reiteration of these tunes are never strict, mimetic representations. They evoke the past, engage the present, and offer what we might call a refiguration of time and our hope for the future. They weave a narrative that is at the same time biblical, historical, situational, and aspirational. It is the story of an Irish rock band with a love for America, a life unafraid of confronting the beloved and calling her to a grander vision. Playing The Joshua Tree in its entirety is sandwiched purposefully in between the earnest yearnings of the band in the early 80’s and with some post-Joshua Tree hymns of celebration and hope amidst ambiguity, brokenness, and longing. They delivered an ode of love to America, the America that in fitful starts and stops was, is, and—most importantly, if we heed the call—is still to come. U2 historians are aware that The Joshua Tree album was at one time going to be called The Two Americas. It is a love song to America that contains the wonder and promise of a new love along with the pain and disappointment in relationships marked by broken promises. Throughout the night, Bono pursued us, cajoled us, encouraged and challenged us to reach for our best selves; selves we envision but have yet to embody with the consistency our self-promotion would seem to indicate. He called us to remember that, when ‘history and hope don’t rhyme,” it is an occasion for renewed action and not cynical resignation. America today feels torn apart, irreparably fissured. The music pleaded with us to read the present with a lens of eschatological hope. Tonight, we can be as one. Up and down the catwalk and in front of the massive video display, Bono—ever the Irish salesman, rockstar, evangelist—serves as our proxy: loving America fiercely at a moment when most of us find ourselves either unable or unwilling to. This love is indiscriminate, holy, practical, and not impaired by rose-tinted sunglasses. As the gathered crowd’s choral singalong with “Pride” began to fade and the enormous Joshua Tree screen illuminated in a red sea of lights, Bono invoked our communal liturgy in whispered tones. He reminded those gathered of our professed values: unity, compassion, justice, and tolerance. He also invoked the memories of those gunned down a year prior in Orlando’s Pulse nightclub, a vicious assault on a community yearning to breathe free, if just for a moment. That jarring memory juxtaposed with the memory of the King assassination laid bare to us the deep ambiguous scars marking the American spiritual landscape. 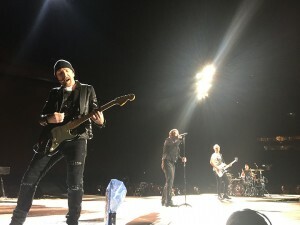 As the Edge nimbly picked out the iconic opening chords of “Where the Streets Have No Name,” the frontman urged us gently to surrender, just as he had done with “Bad” a few moments earlier. For The Joshua Tree part of the show, the band and the images on the behemoth screen engaged in a shamanistic ritual dance engaging the spirits of America—both benevolent and malevolent—calling us gathered to surrender in an honest, confessional and aspirational manner, holding open the possibility of healing. I have to admit that often my U2 fandom resembles the posture of an insufferable door-to-door evangelist whose immersion in the message betrays a lack of critical distance between the material and my experience of it. And yet, in the backdrop of a nation buffeted by deep and seemingly intractable division, I heard “One” for the first time in the depth of the ineluctable brokenness which accompanies all human relationships where we—often in spite of our best intentions—hurt each other again and again. Maybe it is easier having someone to blame. Yet in the depths of all these conflicted feelings, I found my attention periodically shifting from the light and sound spectacle on the stage to the illuminated American flag flying aloft from the upper deck of the stadium. In between the two images, there we were. All 60,000 of us formed into a temporary community, set apart for a moment as citizens of “U2opia,” before being sent back to an America gripped by fear and hate. Feeling deeply this tragic history that continues to manifest itself in our unfolding destiny, I was yet open to sacramental grace pushing through. We get to carry each other even though we’re not the same. What has been misunderstood as a rote retooling of the band’s past greatness is instead a call to a new narrative imagination and loving action. Could a loving, open surrender to our landscape in both its aspirational glory and its violent transgressions address our longing for new dreams this night? 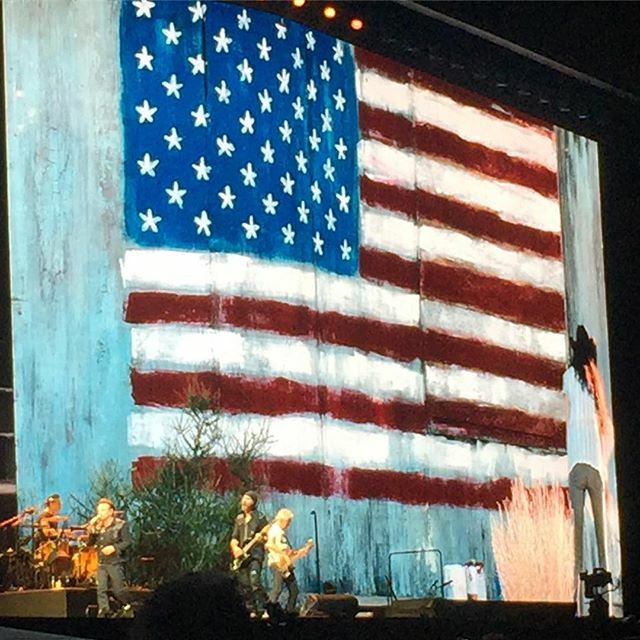 For an America acquiesced to cynicism, the audacity of these guests called U2 can seem maudlin and naïve. But, if I can set aside the false certainties of cynical resignation and uncritical nationalism, if I can admit that, yes, we’re still running, then perhaps, such a message can “set me alight and [we will] punch a hole” through our dark night.